Cheese-Caramel Popcorn: A New Fundraising Flavor! Popcorn Palace is excited to present a brand new option to our stellar list of fundraising popcorn flavors. Please help us welcome Cheese-Caramel! This exciting new fundraising option joins our existing portfolio of fundraising flavors: White Cheddar, Brown Sugar Caramel, Milk Chocolate Drizzle, Chicago Chic®, Cheddarific, Nutty Caramel, Fruit Rainbow, Kettle Corn, Cookies & Dream, Better Salt ‘n Pepper, Spicy Cheese, and White Chocolate Peanut Butter. Cheese-Caramel combines two favorite and popular popcorn flavors, rolling our delicious Brown Sugar Caramel in Cheddar topping. With the sweet and rich flavors of Caramel and the sharp, salty zest of Cheddar, this new flavor combination is perfect for enthusiasts of sweet and savory snacks. Our Chicago Chic® flavor, which offers a mix of distinct Cheddarific and Brown Sugar Caramel popcorns, has been a fundraising crowd-pleaser for a longtime. While popcorn enthusiasts can pick and choose how to eat their Brown Sugar Caramel and Cheddarific pieces in Chicago Chic® popcorn, our new Cheese-Caramel flavor promises a perfect intermingling of sweet and salty, tangy and rich in every individual kernel. We’re big fans of our new fantastic fundraising option, Cheese-Caramel, and we recommend you try it soon. 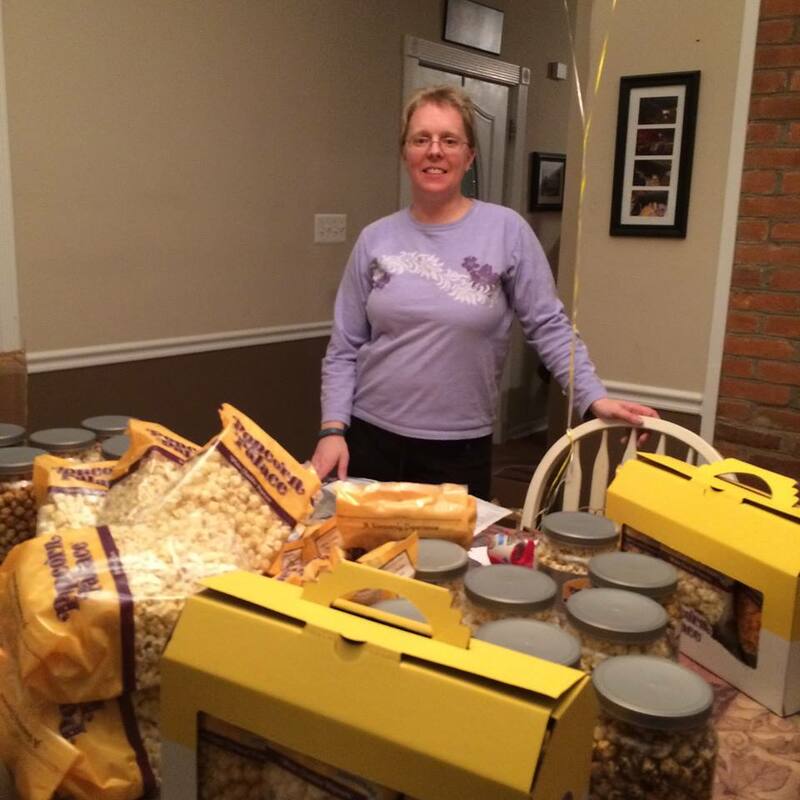 With 50% profit on each item, no upfront costs, and no minimum orders—Popcorn Palace fundraising can help any size organization or organization type meet their fundraising needs! Halloween is the perfect time of year to share tasty popcorn treats with your friends, family, and peers. Popcorn can come in a variety of flavors and containers, and can be mixed with other fun treats for a great snack. They also make inviting gifts and decorations around your home and office to get everyone in the spirit of Halloween. To express our love of Halloween, we’ve made a list of 4 reasons why we consider popcorn to be the perfect treat for Halloween. Everyone enjoys a thrilling scary movie night with friends around Halloween. And nothing pairs a chilly scary movie with friends better than a bowl of gourmet popcorn and hot chocolate. It’s also easy to clean up if you or your friends are surprised by jumpscares! Hosting a costume party is a great way to express your creativity with scary decorations and fun party games. Spend more time on decorating and preparing your custom and less time worrying about snacks with popcorn. The best part about popcorn are the endless creative possibilities with assorted flavors, containers, and themes, perfect for even the pickiest of party guests. It’s a fast and easy snack that fills containers in no-time. Flavored popcorn is a great treat for trick-or-treaters. While most homes will offer store bought candy, you can stand out with flavored popcorn. In just a few minutes, you can make a batch of Witch Hands or Popcorn Jack-O’-Lanterns. All you will need is flavored popcorn, permanent markers, sandwich bags, latex-free disposable gloves, and a tie or ribbon. To make Witch Hands you will need permanent markers, any flavored popcorn, and latex-free disposable gloves, and a tie or ribbon. Fill the gloves with any flavored popcorn and close off the end with the tie or ribbon. Then color the nails of the gloves with markers and draw spiders or write “Happy Halloween” and you’re done. For Popcorn Jack-O’-Lanterns you will use sandwich bags instead of latex-free gloves and draw in a Jack-O’-Lantern’s face. 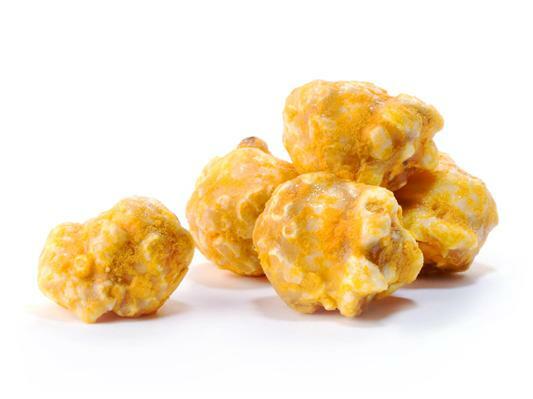 It is recommended that you use cheese flavored popcorn to make the Jack-O’-Lantern look orange. 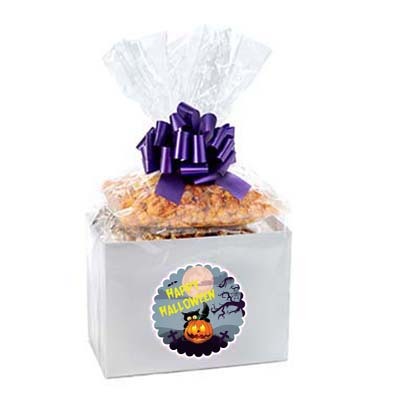 Giving your friends, family and peers a popcorn tin with their favorite assortment of popcorn flavors is a wonderful way to wish them a Happy Halloween. Popcorn Palace offers gourmet popcorn with a variety of flavors – including Brown Sugar Caramel, White Cheddar, and Kettle Chicago Chic™. The popcorn comes in a beautiful silver-engraved tin or a spooky chalkboard gift box, and they can deliver straight to their door. If you would like more information about popcorn flavors at Popcorn Palace or creative Halloween ideas, fill our form below! When Nicole Miller was pregnant with Scott, her second son, she and her husband decided to keep the name they had chosen for him a secret. Scott’s older brother (then age three) was not okay with the decision. After deciding that the baby needed to have his own name, he chose to name his unborn brother after his favorite snack – and this is how Scott was dubbed “Baby Popcorn”. Soon, the Millers were calling the unborn baby by his new nickname, and Baby Popcorn became something of a family celebrity. When Scott was born at 37 weeks old, the family celebrated – but unfortunately, their celebration was quickly replaced with the realization that something was wrong. Scott’s doctors were not optimistic, and as the days passed, the family’s hope began to fade. And then tragedy struck – after just two short weeks on this earth, Baby Popcorn passed away. The Millers chose to transform their family tragedy into advocacy. They made the conscious decision to honor the memory of their son Scott, by joining the March of Dimes – a non-profit organization who strives to promote infant health. Their mission – to support education and research which improves the survival of infants by preventing birth defects, premature birth, and infant mortality. When looking for sponsors for their walk for infant health, the Millers were excited to discover Popcorn Palace. They knew instantly that Popcorn Palace’s fundraising program was perfect for their efforts – a delicious, nutritious, and healthy popcorn, made from all-natural ingredients. You can support Team Popcorn in their March for Babies by clicking here – or to find out more about how Popcorn Palace can help you raise funds for your charitable cause, contact us today. After months of perfecting your routine and building your skills, you’re finally ready to take on the year’s big competitions! In our final installment of our Cheerleading Series, we will be looking at two of the most prestigious competitions in cheerleading – Cheerleading Worlds Championship and The Summit Championship. Committing to hours of hard work leads to a beautiful display of mastery and skill. Pushing for a championship earns your more than a title, it invites you into selective group of peers who share your same drive and passion. Major championships allow squads a chance to go head-to-head with the best in a challenge of heart. At the top of cheerleading competitions, two stand out as being the most sought after – The Cheerleading Worlds Championship and The Summit. The two competitions are the most competitive in cheerleading because they only invite squads who have already won championships. Cheerleading Worlds Championship is hosted by the United States All Star Federation (USASF) in the spring as one of the premier international championships in cheerleading. USASF is a non-profit, founded in 2003 with the core principle of creating standards for safety rules, competition rules, and sportsmanship to dance and cheerleading. The annual Cheerleading Worlds Championship is one of the largest of its kind. The tournament invites over 40 countries around the world to qualify their top squads with over 100 squads in competition. Only level 5 and 6 squads who have won accredited national competitions will receive a bid to qualify. The tournament is a weeklong at Walt Disney World Resort in Orlando, Florida and is broadcasted LIVE by ESPN. The competition is divided into size classes and skill levels. Historically, the majority of squads competing in the Cheerleading Worlds Championship have been American, but that number has been changing. Previous tournaments have seen a growing number of international cheerleading squads join the competition. Each year, countries such as the Netherlands, Columbia, China, New Zealand, and Canada have bring talented squads that have won championships. Canada has been particularly dominant in the international classes with the United States and New Zealand standing not too far behind. The Summit is a newer tournament hosted by Varsity All Star as the definitive all-level national cheerleading championship. Varsity All Star is one of the largest cheerleading companies in the United States. Along with The Summit, they hosts over 250 tournaments and sponsors more than 800 gyms that range a multitude of divisions across the country. The Summit is a summer 3-day event that also takes place at Walt Disney World Resort in Orlando, Florida and it will be broadcasted LIVE by ESPN. Competition at The Summit is fierce, qualifying only the top 10% of all squads in the United States. Bids to compete are given to squads who participate and win Varsity sponsored cheerleading competitions, including a Wild Card round for entry into The Summit. Winners of the Wild Card round will advance to the Finals with second place advancing to the Semi-Final competition. The spirit of competition brings out the best in everyone. Cheerleading championships are an exciting opportunity to meet other squads who are fueled by the same love for the sport as you, and it all starts with the first step. For information about fundraising to start your pursuit for a championship, visit our fundraising page or fill out our contact form below!